Strange in habit, bizarre in appearance, notorious thieves, liars, and even murderers, goblins live on the tattered edges of civilization. Since being driven out from the hidden kingdoms, they have made their way in the mortal world. As exiles and freaks, goblins are tolerated—but only just. They make their homes wherever they can, whether in the forests and hills of the countryside or in the sewers and rubbish heaps of the cities. Still, no matter how hard their lives or how filthy or foul their homes, goblins hold their heads high, knowing they are more than they appear. Goblins have the will and ingenuity to turn a bad situation to their advantage. They might be a wretched people, but they embrace their wretchedness. They seem to revel in squalor, never bothered by the muck and grime, nor do they shirk from foul acts to gather food, clothing, and shelter. Snot and Stitches peers into the stinking and strange world of the goblins, revealing their origins and how they fit into the world. This supplement also offers detailed character creation rules to help you develop intricate backgrounds for your goblin characters. 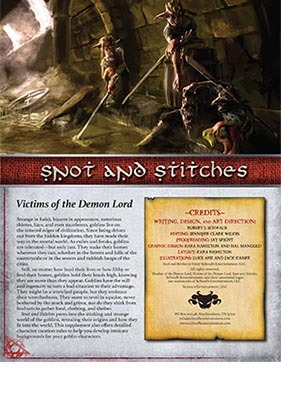 Buy Snot and Stitches as a PDF from Schwalb Entertainment or DriveThruRPG!